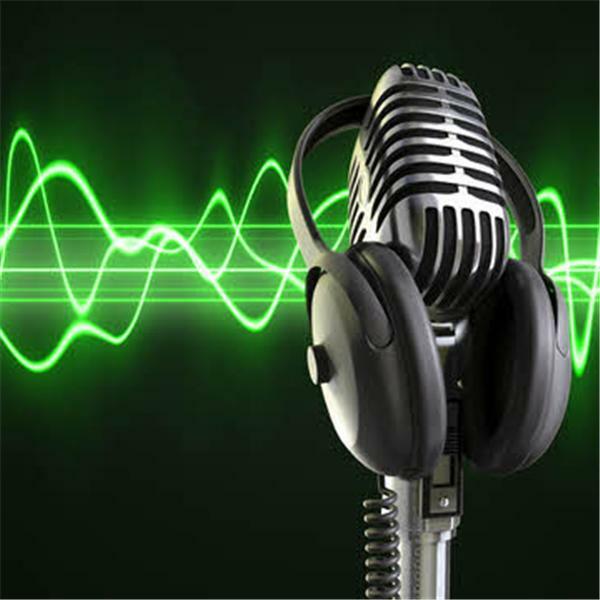 Everyone knows how much conservatives love (and do well) political talk radio. It's dominated by folks like Rush Limbaugh and, to a lesser degree, Sean Hannity and a cast of others. Liberals don't do well with the medium, at least not nationally. See the difference? 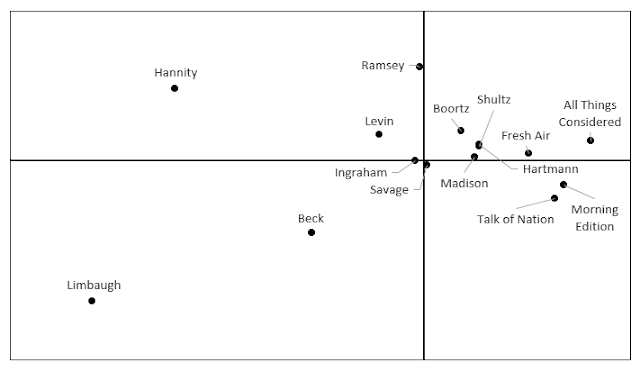 Conservatives distinguish among the various host-based programs, especially Limbaugh and Hannity, but also Glenn Beck and the rest. But conservatives are more likely to lump together the various NPR programs, to not distinguish among them all that much. What's it mean? From a theoretical perspective this fits, to some degree, in-group and out-group differences. We tend to see lots of variety in our in-group and see all those out-group people as all the same. To put it in college terms, a frat member will see lots of variety among members of fraternities, but an independent (non-Greek) may see them as all the same. That's what I think is happening here. It's the core of a larger study I'm doing. 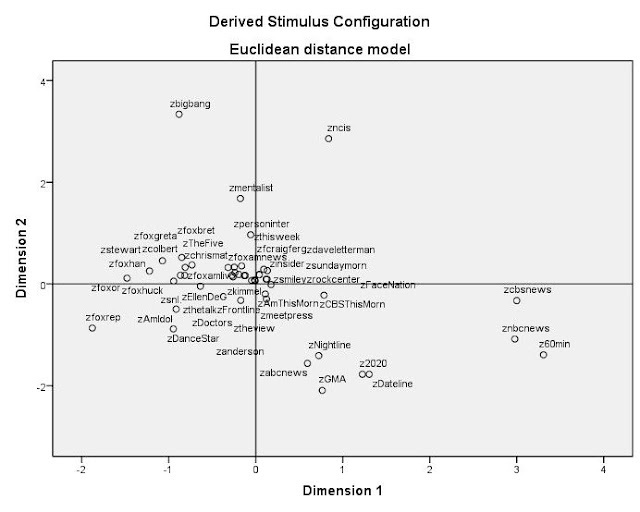 I'm playing with some data, exploring really, testing it to see if there is a paper worth pursuing. As you can see above, I'm looking at how people "map" television programming. 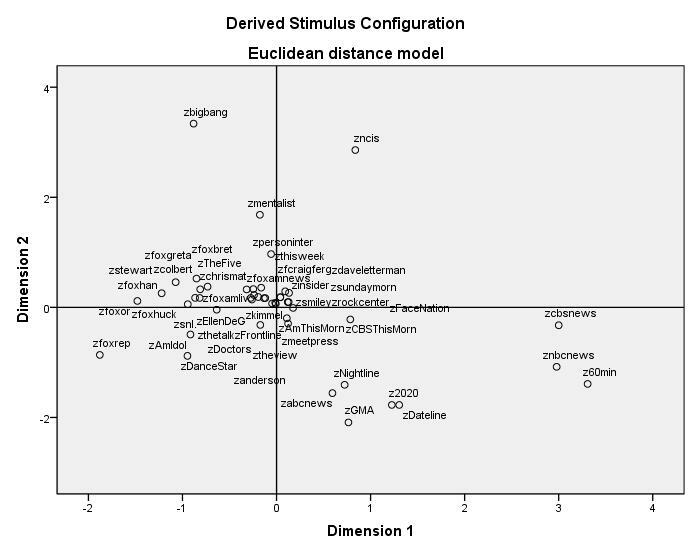 Ignore the "z" in front of all the variables, that's a naming convention I use in SPSS. For a more serious presentation I'd do it differently. 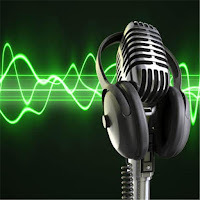 So what we have are 48 television programs and how a national sample "maps" them using a procedure called ALSCAL. Look at Big Bang Theory. All by itself high on the Y-axis along with, on the other quadrant, NCIS. How you do this is try to figure out what the X and Y axes are measuring. So looking only up and down, along the Y-axis, it looks like entertainment versus news, but below that horizontal line we all see Dancing with the Stars and American Idol. So maybe it's scripted television versus not? If we look left-to-right, along the X-axis, we see far to the right some news shows and 60 Minutes, while far to the left we see some Fox News progtams and Jon Stewart (this is 2012 data). 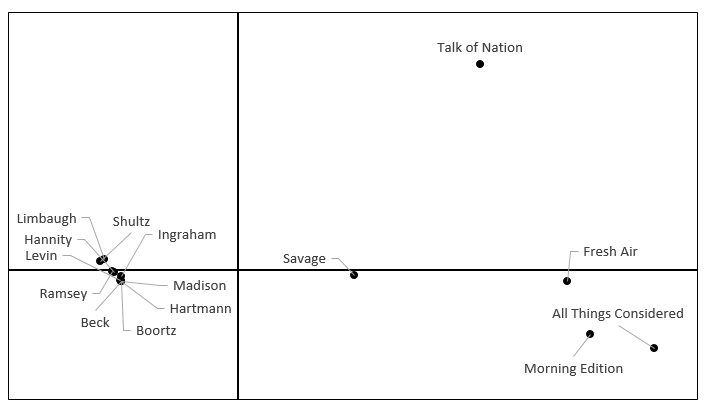 We might guess that the X-axis is ideology in some fashion, as in ideological (far left) or not (far right). Or maybe it's cable vs broadcast? No idea. Another way to do this is look at quadrants and see what holds those shows together as compared to the shows in a different quadrant. So the top left quadrant as Big Bang Theory, a bunch of Fox stuff, an MSNBC show, and the Mentalist, among others. What holds that all togehter as compared to the bottom left quadrant? Not much that I can tell. And of course as I do this, I have in mind looking at diffent kinds of people and how their "cognitive maps" of television differ. Yes, the campaign and presidency of Donald Trump has one positive impact -- it will launch a thousand dissertations, a million research studies. Indeed, they're already emerging in academic journals. I point to this one, published a few days before the election, that looks at authoritarianism, cognitive ability, and support for Trump. Read it if you like, or check out the image below directly from the study. This is a path analysis and lemme explain. 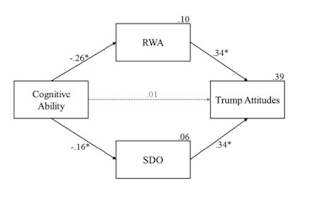 Cognitive ability is a negative predictor of two different measures of authoritarianism, RWA and SDO. That means the greater your cognitive ability, the less authoritarian you are. RWA is an index of right-wing authoritarianism and is measured by such questions as: “Our country will be destroyed someday if we do not smash the perversions eating away at our moral and traditional beliefs.” SDO is a measure of social dominance orientation and is compromised of such measures as “Inferior groups should stay in their place.” So the more cognitive ability you have, the less authoritarian you are. 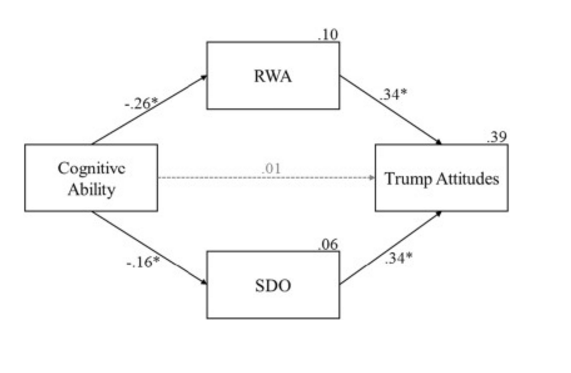 Cognitive ability has no direct effect on attitudes about Trump, but, when funneled through two measures of authoritarianism, there is a strong effect. The more authoritarian you are, the more you like Trump. In the fine print, the authors note they statistically controlled for such factors as gender, age, income, and education, and those controls did not alter the results seen above. We'll see lots more and I'm planning my own studies as data become available. More on that another day. Just messing around, Hillary Clinton did better in Georgia among those who voted early as compared to those who voted on Election Day. She still lost in both cases, just not as much. In Georgia there was a 76.25 percent turnout, or 4,152,100 votes cast compared to 5,445,078 registered voters. These are unofficial results. Numbers may move around a bit. So as you can see above, Clinton had about two percentage points more votes in early voting, which fits the usual expectations of more Democrats taking advantage of advanced voting. Still that wasn't enough to win Georgia (or pretty much lots of other places). Others have broken down the Clinton-Trump race by counties and regions, so I see no reason to recreate that analysis here. I'll let the polling pros do their forensics and take apart what went wrong, and sometimes right, with the pre-election polls. Once that's done I may add more. In general it seems less a case of "shy" Donald Trump voters and models that overestimated or underestimated turnout by key voting groups (minorities, less educated whites, etc.). I'll also wait until more data are available to get at a question that always interests me -- the consent, or lack thereof, of the losers. Already we're seeing "Not My President" marches, which, to me, is as stupid as the kooks who said the same thing when Barack Obama was elected in 2008 and again in 2012. Here I raise this question -- if Trump had lost to Hillary Clinton, the "surprised losers" in that scenario would have been angry. I suspect most Clinton "surprised losers" today are less angry than sickened. Those are very different emotions. Anger can sometimes attempt to legitimize an outcome, thus threatening democracy and the electoral process. Being sickened by an outcome, that's less likely to result in those kinds of democracy-threatening outcomes. So let's see. Yes, once data are ready, I plan on examining the "surprised losers" among Clinton supporters to explore just what their feelings are about the electoral process. And of course I'll look at their media use and see what predictive power that may have. In general, unlike some previous elections, I do not expect powerful negative feelings about democracy and the process itself, but you never know. That's why we do the research. And in Spring I teach a graduate class in Public Opinion. I tried to cancel it today, saying public opinion is dead, given its lousy calls prior to the election. That's great, the grad dean said, but I've still got to teach the class. Ten students already signed up. Sigh.